“The device uses a patented waveform of three frequencies: 15 Hz, 500 Hz, and 15,000 Hz. The amperage that the device uses is 1-4 mA (level 1-4). The device uses a bipolar square wave frequency.” Unfortunately, we do not have the duty cycle. I was interested in understanding the conditions of electrostimulation. Here are some excerpts from different articles on the scientific evidence page (instruments from different companies). The Neurotone 101 was used. It is a transistorized, battery-powered frequency source that generates a gated sine wave burst of current with no direct current bias. Burst rate was 100 hertz/second with a burst width of 2 msec. This current was used to treat the alternating current treatment group. For the direct current treatment group the output was rectified and filtered to form positive square wave pulses of the same width and frequency. The original FDA grandfathered CES device, the Neurotone 101, pulsed at 50 and 100 Hz, biphasic, on a 20% duty cycle. There was no dc bias. Four Neurotone 101 units were used for the CES treatments. These promised a series of low intensity, sinusoidal electric impulses at 100 pulses/sec on a 20% duty cycle with current variable from 0.0 to 1.0mA. The apparatus was a Neurotone 101 manufactured by Neuro-Systems,Inc. of Garland, Texas. It is a portable, battery-operated, solid-state unit which generates a gated sine wave burst of current with no dc bias. Burst rate was 100 Hz, with a width of 2 msec. A Neurotone l0l (9) set to give a 20 V unidirectional square wave of 2 msec duration at a frequency of I00 Hz. with a maximum current of 1.5 mA was used. The Alpha-Stim SCS provides cranial electrical stimulation by generating bipolar, asymmetric, rectangular waves with a frequency of 0.5 Hz and a current intensity that can be adjusted continuously to provide between 10 uA and 500 uA. An anode was placed on each eyelid and a cathode applied to the mastoids. Such a disposition allows rather low impedance levels (500-100 [l for the anode-eyelid contact and 1500-2000 [l for the cathode-mastoid contact). Rectangular monophasic pulses of 0.7 msec duration were delivered at a frequency of 350 Hz, the intensity of the stimulation being adjusted to just below the cutaneous perception threshold, which corresponded to approximately 1-1.2 mA. Pulse Mazor Instrument’s Transcranial ElectroStimulator (TCES) equipment, Pulsatilla 1000 (Pulse Mazor Instruments, Rehovot, Israel). A paramedic (other than the evaluating doctor) administered 8 30-min treatment sessions, on 8 consecutive weekdays. The instrument was in mode 3, which is asymmetrical, biphasic shape for zero net charge, 77 Hz of frequency, and 3.3 millisec of pulse width (± 5%), in a dual channel current manner. This pulse shape prevents charge accumulation in the tissue. Patients receiving placebo were treated with a 50 Hz signal with maximal current of 0.75 mA (as described previously (6)). Article by Scientific American :""Does Zapping Your Brain Increase Performance?" 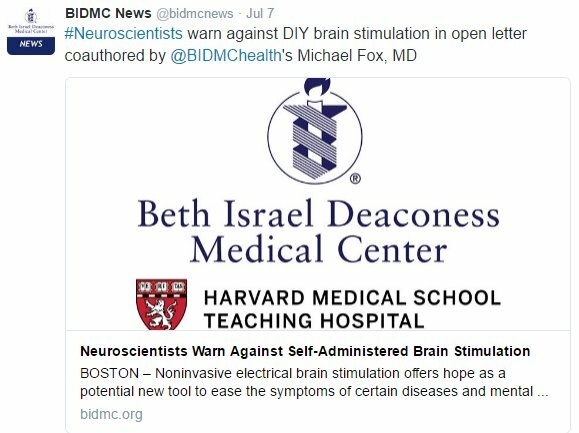 "The evidence for neurostimulation is decidedly mixed"
"In October 2008, rTMS was approved for use by the FDA as a treatment for major depression for patients who have not responded to at least one antidepressant medication." A changing flow of magnetism (represented by magnetic lines) as magnet is being moved towards coiled wire. Electricity is detected by the instrument. During a TMS procedure, a magnetic field generator, or "coil" is placed near the head of the person receiving the treatment. :3 The coil produces small electric currents in the region of the brain just under the coil via electromagnetic induction. What happens if you deliver electicity to cells? If you change the voltage of neurons you can induce the release of neurotransmitters. Depolarization in the context of biology refers to the sudden change within a cell during which the cell undergoes a dramatic electrical change. Most cells, especially those that compose the tissues of highly organized animals, typically maintain an internal environment that is negatively charged compared to the cell's surrounding environment. This difference in charge is known as the membrane potential of the cell. In the process of depolarization, the negative internal charge of the cell becomes positive for a very brief period of time. This shift from a negative to a positive internal cellular environment allows for the transmission of electrical impulses both within a cell and, in certain instances, between cells. "Illustration of the major elements in chemical synaptic transmission. An electrochemical wave called an action potential travels along the axon of aneuron. 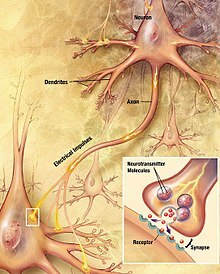 When the action potential reaches the presynaptic terminal, it provokes the release of a small quantity of neurotransmitter molecules, which bind to chemical receptor molecules located in the membrane of another neuron, the postsynaptic neuron, on the opposite side of the synaptic cleft." Determination of the magnetic field strength that results in an an observable motor response, such as the movement of the thumb. Measured in SMT units. FDA Link SMT Unit: So that measurement of stimulator magnetic field output may be standardized, the SMT unit is suggested. 1.0 SMT is the output setting of a rTMS device that corresponds to an induced electric field of 130V/m at a point located at the fixed distance of the target along the central axis of the coil from the surface of the scalp into the cortex. "Transcranial magnetic stimulation (TMS) is performed by placing on the skull, above the motor cortex, an electromagnetic coil that supplies an alternating current generated by a capacitor. This produces a time variable magnetic field of duration of 100-200 μs. The intensity of the generated magnetic field is about 2 tesla (value corresponding approximately to 40,000 times the Earth's magnetic field or, roughly, to the magnetic field used in magnetic resonance imaging). The variable magnetic field induces a current flow in the nervous tissue sufficient to produce a neuronal depolarization.